My husband is a wonderful travel planner. Together we have visited some of the world’s beautiful places. Among the beautiful places we have visited is Italy. We have been to Rome and Southern Italy. This year our travels led us to Venice and down through Umbria. We arrived in Italy by air and Venice by ferry. It cost 15 Euros to travel from the airport to the Rialto Bridge. From there we walked to our hotel. There is no real option but to walk. While Venice is famous for gondolas; and while there were also water ferries and water taxis, Venice is simply a place for walking. There are no automobiles in the city which means no taxis. Baby strollers, wheelchairs, bicycles and motorcycles are rarely seem and barely helpful. The combination of bridges, dead-ends and sharp corners aren’t conducive to any other form of travel, and so we walked. 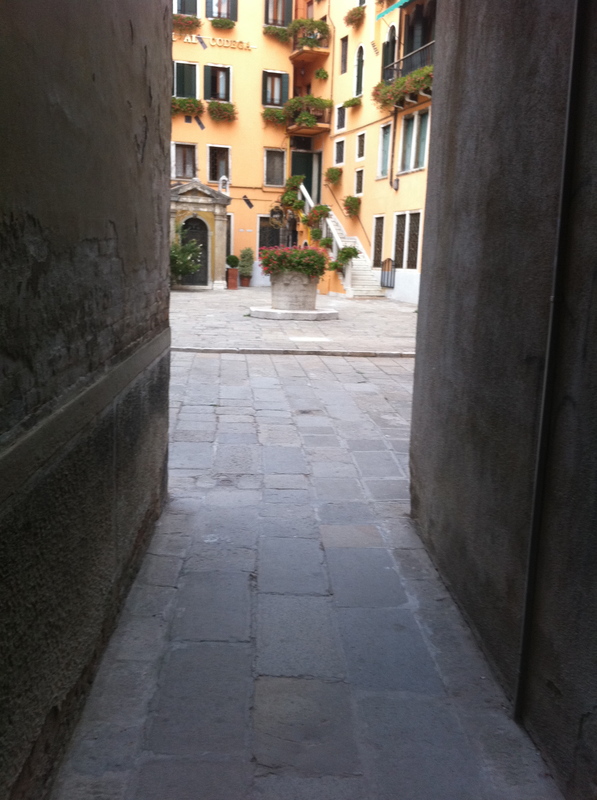 We easily found our hotel, “Al Codega”, in the heart of Venice. Recently remodeled it was a perfect pick by my travel savvy husband. Close to the Rialto Bridge and Saint Mark’s Square, it was an oasis at the end of a busy day of sight-seeing and shopping. The decor is charming. There is a small hotel bar with service by the concierge/ bartender. He can give you travel advice while serving drinks and offering up chips and peanuts, the only food items available. The bar and breakfast areas had a computer and Wi-Fi access. Sometimes they worked! When I called Meg to tell her we had arrived, I was amazed to find that my iPhone automatically adds the international access numbers when placing calls to the states. This was new to me. l just punched my phone’s automatic dial for Meg’s number and within seconds heard her voice. There are a lot of wonderful places to visit in Venice. We missed most of them. There is really no reasonable way to move quickly around Venice to see it all. But considering the beauty of Venice we really didn’t care. Many of the streets, buildings, the canals were breathtaking. We walked through ancient streets and never knew what we were going to run into next. 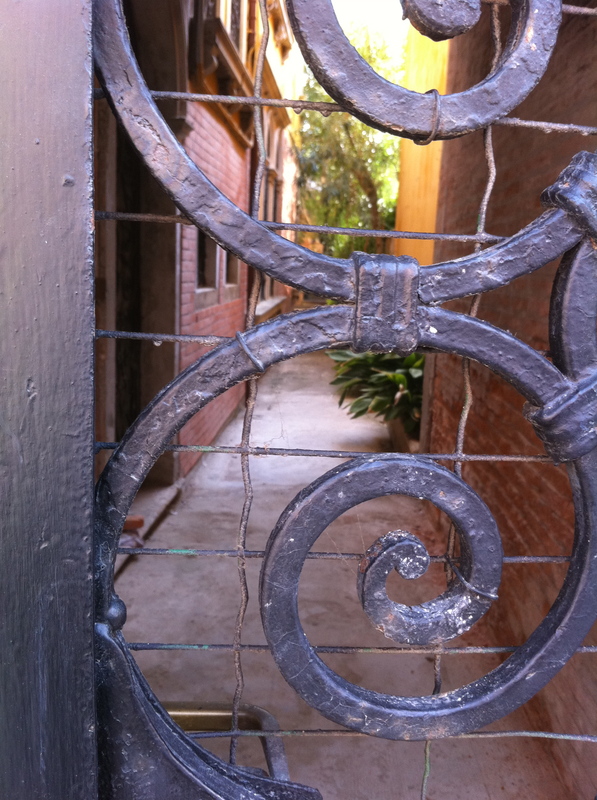 We could find ourselves in blind alleys that led nowhere or come upon a gallery or museum or courtyard. Almost every courtyard had a covered well, presumably once a source of drinking water. And while people sometimes complain about the smells in Venice, the only thing we smelled was the onions, garlic and similar smells of the many restaurants. We visited the Guggenheim, Harry’s Bar and a host of beautiful, if lesser known churches. We didn’t visit Saint Mark’s Cathedral, the line was too long and our visit too short. We also missed the Vivaldi concerts. They began at 10 p.m. and decided we were unwilling to attempt to find our way back to the hotel that late at night. Venice is simply not a city where we could call a cab if we were lost. The Guggenheim was lovely. We enjoyed the art, but it was the building, and the proximity to the main canal that is most memorable. We also had a wonderful visit to Harry’s Bar, a well-known bar catering to those willing to spend a bit more for drinks just for the pleasure of people watching. It was with regret that we left Venice but after 40 hours we said farewell to the city and were on to the next leg of our adventure. This entry was posted in Travel & Adventure and tagged Guggenheim in Venice, Harry's Bar in Venice, travel, travelling in Venice. Bookmark the permalink.